Say it ain’t “snow”! Now what do I do? What a week! Western New York got its first real accumulation of snow this week! My parents have over 6 inches on the ground already, while at my house in North Tonawanda, we had only a dusting. This was on Wednesday night of this past week. 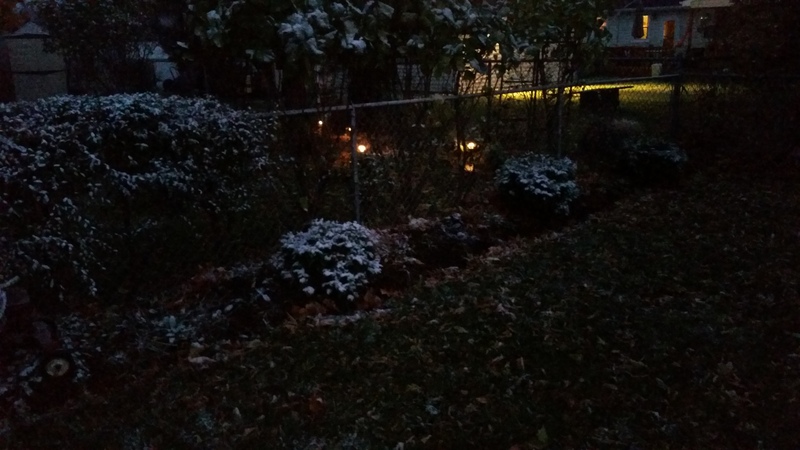 I just had arrived home from work and snapped this pic of our first “snow” in my backyard. It looked pretty to me. This coming week is forecasting to dump some major snow on us, all in thanks to the Lake Effect machine we call Lake Erie. Great Lakes living at its finest! 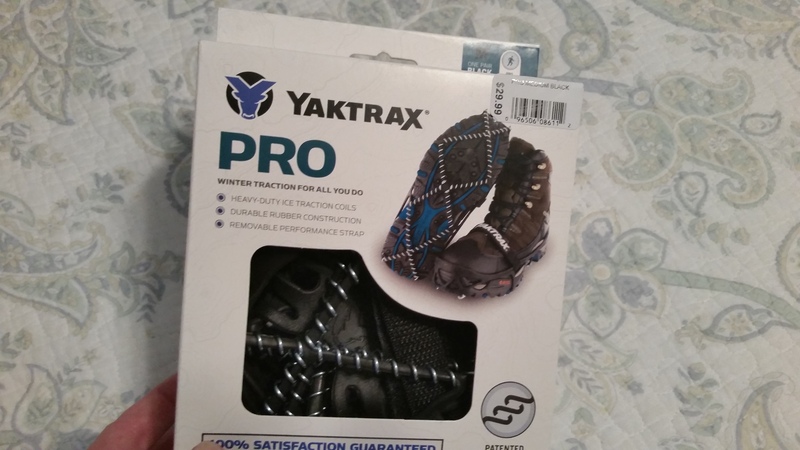 No need to worry, my car is stocked with blankets, shovels, boots and I just purchased a new pair of YakTrax for my boots and shoes. The last pair I purchased was over six years ago and they have seen better days. I am prepared for the weather to come! This is always the time of year that nobody looks forward to. That icky transition from Fall to Winter, even though Winter is officially a little over a month away, this time brings unpredictable, icky weather that really doesn’t allow for much time outside. In between it getting dark at 5 at night, and the icky cold, windy weather that isn’t easy to do anything in, it’s easy to see how many people get the “Winter Blahs.” I took my daughter on a nature walk last week through a wildlife sanctuary, and it was so windy and cold, thank goodness it wasn’t a long trail! 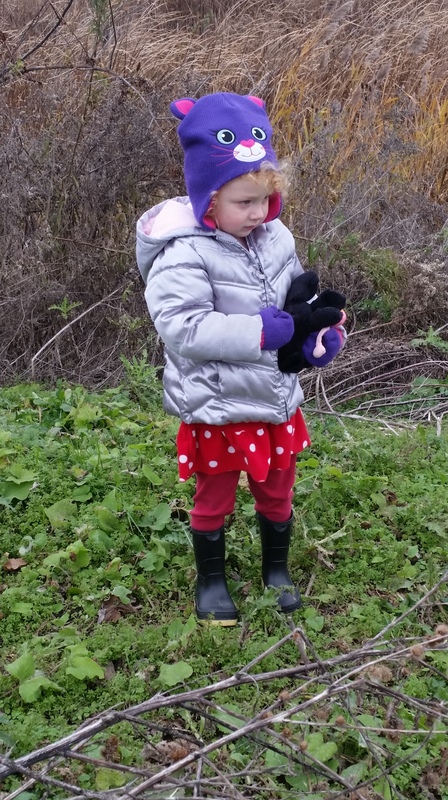 She loves being outside, but I don’t think she was loving the wind on our marsh walk! Research, Research, Research — utilize the down time you have to start planning for next year’s growing season. Pick up some magazines such as Fine Gardening, Garden Gate or English Garden to get inspired and get some great ideas for your gardens. All of these periodicals happened to be my favorites. Start making a list of what you would like to do next season and write down the seeds and bulbs you would like to purchase. The research phase of the “off-season” is something I have always enjoyed, and you will too! Get Educated — Take a look at some horticulture classes that are available near you, or take a class online. There are also some free classes and webinars out there, as I have taken a free landscape design class at my leisure. It’s always important to understand how gardening and growing works, and if you learn the “ins and outs” of it, the better you will be able to enhance your own little gardening spot! Take It Inside — Just because you can’t play with your outside plants doesn’t mean you can’t purchase and work with an inside garden! Houseplants are just as interesting, and I started really adding to my collection last Winter, so I have some really cool houseplants that I will be sharing with you for the duration of the Winter. Different houseplants require different care. That keeps you busy in itself! Get Back to Nature — Embrace the season. I am a very active person and outdoor enthusiast, I like to exercise and take advantage of all the weather Western New York has to offer, which includes all four seasons–some longer than others. When Winter rolls around, I am usually sledding with my daughter or snow shoeing and cross-country skiing. I am known to walk and run during the Winter, but have limited my exercise outside to just walking anymore. Just enjoy what Mother Nature has to offer. You will come across some pretty cool things. So Winter Blahs no more! Enjoy and grasp the season for all it is worth! It could be the down time you need to come up with something spectacular for your garden next season!